June 26, 1954 (Hurricane Alice): This storm quickly developed off Brownsville. It made landfall within 24 hours of formation. Most residents did not know about it until it was upon them. Heavy rains near Langtry resulted in 27.10" of rain at Pandale. This caused the greatest rise on the Rio Grande since 1865. The river rose 30 to 60 feet at Eagle Pass and Laredo. An 86' wall of water rushed down the Pecos River; this washed out a bridge normally 50' above it. The International Bridge at Laredo was also washed out. Most of the death and destruction occurred in Mexico. 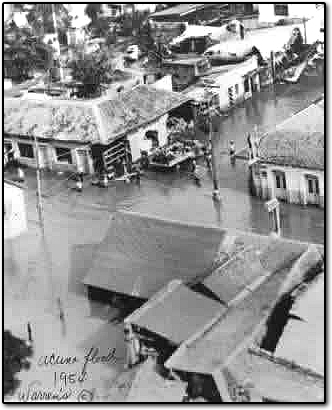 The flood plain of the Rio Grande and the land adjacent to Arroya de Las Vacas were underwater during the flood of 1954. While the International Bridge sat above the water, the approaches to it were destroyed, rendering the bridge useless. The streets of Acuna were flooded as well. Over 10,000 people had to be evacuated to highest ground. Helicopters and airplanes ferried potable water, food and other supplies to Acuna for weeks until the International Bridge could be reopened. The 1954 flood destroyed the railroad bridge over Devil's River. In 21 hours, 18 inches of rain fell at Ozona in Crockett County on Val Verde's north border. As much as 30 inches fell in locales along the Pecos River to the west. All of the runoff funneled down the Devil's River, Pecos River and Rio Grande, causing much damage. 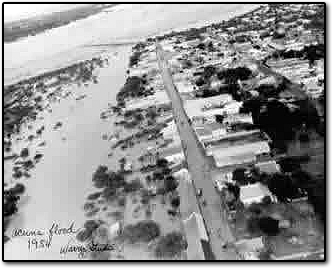 The 1954 flooding hurried the process of building a flood control dam on the middle Rio Grande. The massive dam project was to be called "Amistad," the Spanish word for friendship although, originally, the project name was Diablo Dam, named for the nearby Devil's River. American President Eisenhower and Mexican President Lopez-Mateos are credited with the change of name. In July 1960, President Eisenhower signed the Amistad legislation appropriating the first monies for the dam project and on Oct. 24, Presidents Eisenhower and Mateos met in Ciudad Acuna. A local annual celebration called Fiesta de Amistad, commemorates the presidential meeting.